Ongoing renovations of Clifton’s downtown area mean visitors can easily carve out a relaxed weekend. Each of the Screen Door Inn’s seven rooms features an antique screen door, lending a touch of nostalgia to an overnight stay. The sounds of a screen door opening and closing evoke powerful memories. My grandfather’s 1920 brick house in Dallas, where I spent a lot of happy time while growing up, had a screen door off the kitchen door leading to the backyard and another in front, on the screened-in porch. Sometimes they would shut with a muffled bang, as when Pop Pop and I slipped out before breakfast on warm August mornings to pick figs, and sometimes with a gentle squeak when the sun was finally dropping from sight and I would dash out to chase fireflies. The Screen Door Inn is at 110 N. Avenue D in Clifton. Rates start at $99 per night. Call 254-675-7829. The somehow reassuring noise of these doors in action signaled people I loved coming and going; it’s forever filed with memories labeled “comfort” in my psyche. So upon stepping into the Screen Door Inn in Clifton, I was immediately swept into a mood of sweet nostalgia by walking through such a door. I asked my husband, who’d come with me, if he had similar recollections from childhood. It turns out that he, too, has a nearly identical memory from his beloved grandmother’s home. My guess is that a lot of folks feel transported when staying at this seven-room inn. Each room’s entry is hung with a vintage screen door outside the room’s solid door. And they’re not just any old screen doors—these are the restored originals that came with the early-1900s building. Once a boarding house, the two-story brick building employed screen doors to provide ventilation on warm days in the years prior to air conditioning. 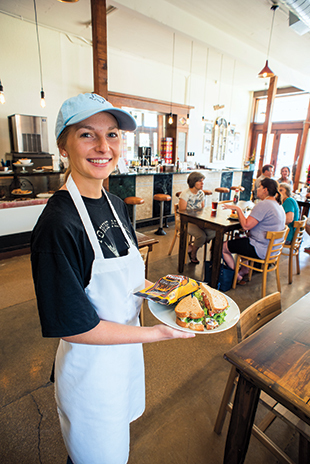 Meal options include comfort fare at the Corner Drug Café. 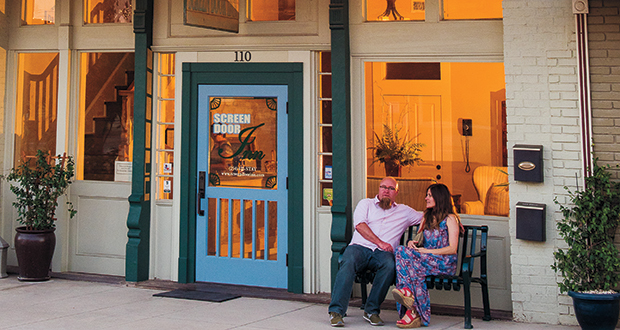 The inn, a small barbershop, and a restaurant called the Corner Drug Café occupy the Brooks Building in downtown Clifton, a town designated a Texas Cultural Arts District in 2011 by the Texas Commission on the Arts, thanks largely to ongoing programs at the nearby Bosque Arts Center. As downtown’s renovation began nearly a decade ago, locals dove into action. Smart investors saw the need for a downtown inn and joined in the renovation of the building, which had served as home to a hotel, apartments, doctors’ offices, and a beauty shop in addition to its years as a boarding house. Its second floor had sat empty for some 50 years and was deemed perfect for a lodging in the center of Clifton’s revitalization. The inn opened in early 2012, with six guest rooms upstairs and one on the ground floor, just off the welcoming lobby. Making a connection to Clifton’s cultural designation, several rooms feature art, history, and heritage themes. The Studio, the only room on the ground floor, features a wall hung with paintbrushes, scissors, and other art implements. A room called Norse pays tribute to Bosque County’s deep Norwegian heritage; the Lone Star room highlights Western antiques. And our home for the night, a comfortable, spacious room called Marquee, is decorated with vintage movie posters and overlooks the restored, 101-year-old Cliftex movie theater across the street. Most furnishings in the inn came from local estate sales and resale shops, and some Clifton residents donated pieces for use in the interior design. Some materials salvaged in the building’s restoration became headboards, tables, and other furniture pieces. Details throughout the inn serve as little windows to the past: The upstairs hallway’s original beadboard ceiling and walls, as well as the pine floors, are worn but painstakingly restored. Framed century-old photos of Clifton decorate the hallway, and the lobby features exposed brick walls that survived a 1906 fire. Just outside the Screen Door Inn, we found other places tethered to Clifton’s history. The Cliftex Theatre, with its sand-colored stucco exterior and green-and-blue neon sign, is perfectly restored to its 1916 glory. Its low prices are from another time, too, with $5 admission to first-run films and popcorn and drinks costing a fraction of what’s charged today at the multiplex. Down Avenue D at West Third, a renovated feed mill now houses Market at the Mill. With inventive home goods, it reminds me of the famous Magnolia Market in Waco, and it also presents a full calendar of live music featuring local and regional acts. One mile east of the inn, the Bosque Art Center occupies the 1923 Clifton Lutheran College building and also spreads to a more modern addition. The old college auditorium has recently been renovated, and it’s a venue for concerts like a recent one starring country and gospel singer Larry Gatlin and another this fall with Cajun-influenced country artist Eddy Raven. 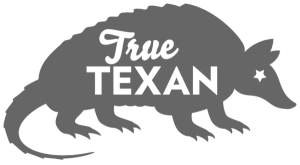 The art complex is also home to various workshops and shows throughout the year, including the annual Bosque Art Classic, a juried art show and sale that awards thousands of dollars to winning artists. Work by local and regional artists make up the art center’s permanent collection. And we found still more by local artists at the Treaty Oak Art Gallery, down the street from the Screen Door Inn. While paintings and drawings dominate the gallery’s offerings, there are woodcraft, sculpture, and mixed-media pieces, too. As we explored, we made time to eat at the two best places in town, both found inside meticulously renovated spaces. Two blocks from the inn, The Sinclair offers dishes like yellowtail snapper with zucchini and chimichurri in a former gas station. And just below our room, the Corner Drug Café won us over with a made-from-scratch breakfast of house-made granola and buttermilk biscuits with cream gravy, as well as baked goods like lemon-blueberry muffins, chocolate cream pie, and a cookie of the day. Corner Drug swept me back to earlier years, as well, especially as I dug into those perfectly flaky biscuits. It’s good to reopen that “comfort memory” file now and then.